I am totally ecstatic about how well my Candy Corn Marshmallow Pops turned out. I officially broke down and am allowing the kiddos to have some friends over for a Halloween get together with a few friends. Crossing my fingers that my stress level does not go through the roof, ha ha. Teenagers and candy do not go well together (especially the 13 year olds). I have made marshmallow pops in the past for other holidays but had never considered throwing them togehter for Halloween. Absolutly adore the candy corn look so I figured I would take a stab at making some candy corn inspired pops for their little party. While shopping in Michael’s Crafts this past week I noticed Wilton Chocolates on sale for $2.49 each. I figured this was a pretty good price as the Wilton Chocolates make quite a bit of chocolate. I love how bright and smooth the colors always turn out. If you are needing Wilton Chocolates to whip up these Candy Corn Marshmallow Pops and not looking to shop in-store, consider snagging your Wilton Supplies on Amazon . I like making up quick and simple treats and this one really fits that description. Marshmallows and chocolate are always so tasty together too! Heat Candy Chips by microwaving for 30 seconds stirring and repeating until melted. Allow to cool for 2-3 minutes. 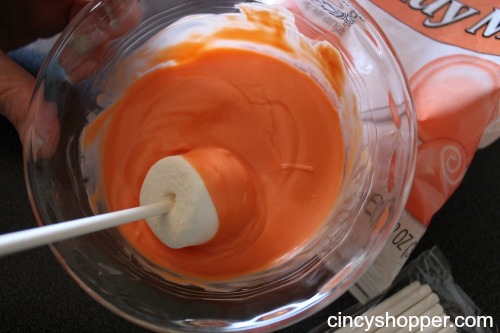 Dip marshmallow and coat 2/3 way up in melted orange candy and rotate to coat completely. Place on wax paper and cool in refrigerator for 10 minutes to set candy mix. 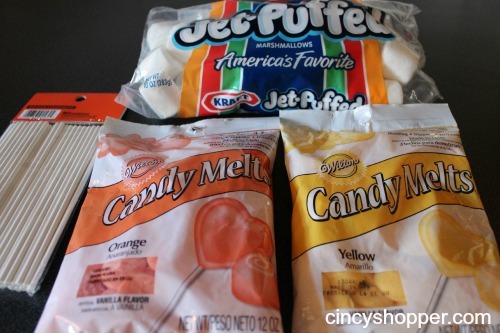 Dip marshmallow and coat 1/3 way up in melted yellow candy and rotate to coat completely. Place on wax paper and cool in refrigerator for 10 minutes to set candy mix. 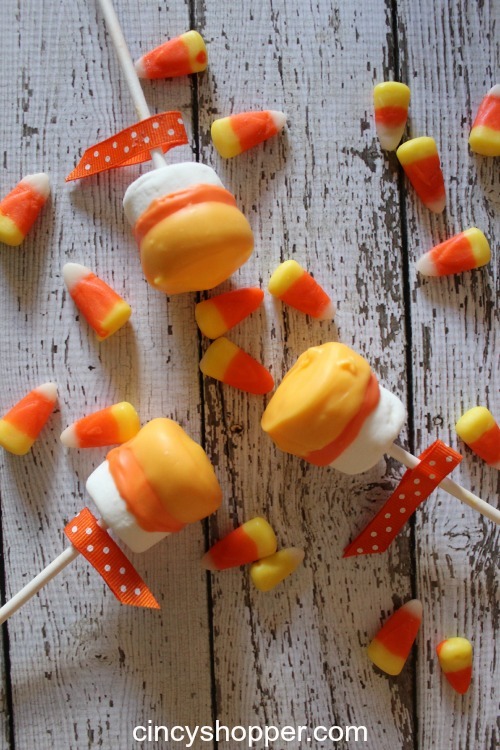 If you are looking to whip up a quick, easy and attractive treat for Halloween consider making these Candy Corn Marshmallow Pops. They are just so easy and leave little room for error. Looking for other Halloween Treat Ideas? If so, you can see my Pumpkin Rice Krispie Treats here. Or, my simple and quick Candy Corn Cupcakes I made. They look fantastic Jen !!! They look fantastic Jen , your becoming very Crafty Girl! 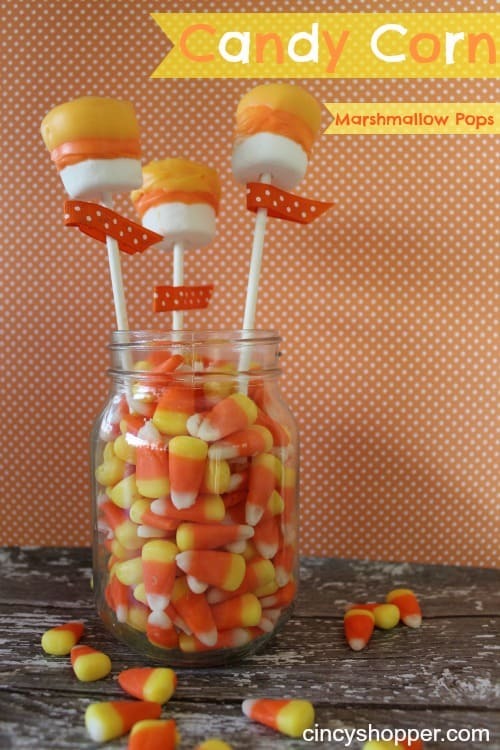 These are just adorable, Jen…I love candy corn everything this time of year! Thanks for sharing such a cute idea!